September 2005, Volume 2 Issue 9 Know It - Profit! Oil has been the driving force in the markets this summer... driving them into low gear, it seems! As high as $70 a barrel, oil has been holding back an otherwise healthy economy. 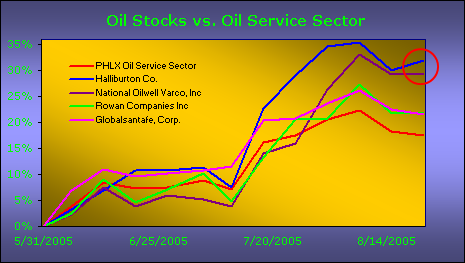 However, there are profits to be made in oil sector stocks... I'll show you where! 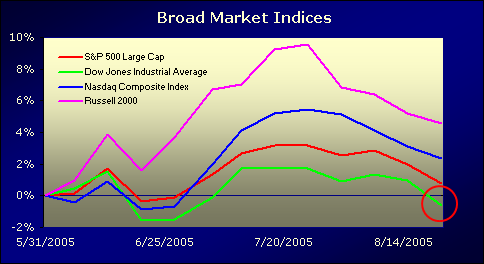 But, before we go there... how are the broad indices holding up? Recently, all the major indices have been giving up higher ground. However, the Russell 2000 managed to score a five percent gain over the last three months. The Nasdaq Composite and Standard & Poor's 500 also are still in the black with two percent and one percent gains, respectively. Only the Dow Jones Industrial Average has dipped into negative territory... posting a one percent loss for the period. The PHLX Oil Service Sector leads the way with an 18 percent gain over the last 120 days. The AMEX Securities Broker/Dealer Index and the AMEX Natural Gas Index have advanced, as well... up 14 and 13 percent, respectively. And... continuing its steady climb is the AMEX Healthcare Index, profiting 12 percent for the period. 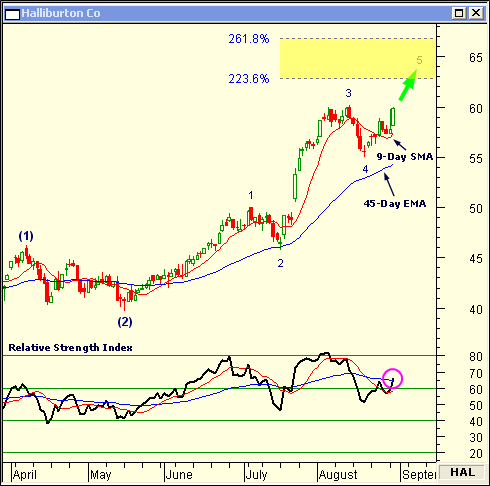 Halliburton Co. (HAL) and National Oilwell Varco, Inc (NOV) have posted exceptional gains... over 30 percent. Rowan Companies Inc (RDC) and Globalsantafe, Corp.(GSF) also have tacked-on substantial profits... advancing 22 percentage points each. In mid-August, HAL put in a minor fourth Elliott Wave low near $55. Price has found support at the 9-day simple moving average (SMA) as it begins to complete its fifth minor Elliott Wave. A Fibonacci price target between $63 and $67 can be projected from the minor first Elliott Wave. The upward momentum is showing no signs of weakening as the relative strength index has turned up above its 9-day SMA and 45-day exponential moving average (EMA). In the April 2005 issue of Chart Wealth, LifePoint Hospitals Inc (LPNT) (View Chart) was trading near $42 per share. I called for LPNT to continue on its measured move up to near $48. In retrospect, the December 2000 high was the better price target. Over the next four months, LPNT made a solid 21 percent gain... climbing 9 points to $51. And... you can take that to the bank! 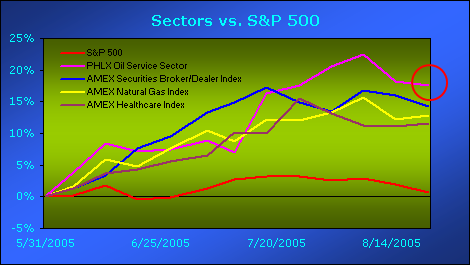 Even though the markets have been spinning their wheels as of late, there are always stock sectors pulling ahead. Jump on these opportunities and you will make money in a soft market.